I don't know about anyone else but I am finding it really hard at the moment to know what to wear. One day its sunny the next its snowing (no joke) but I finally have some key pieces in my wardrobe. These pieces are going to be perfect for taking my style from winter to spring without having to invest in a whole new wardrobe. They also aren't that expensive and can be worn so many different ways I will be living in the same outfits for the next few months. One colour that I don't have much of in my wardrobe is navy and why I don't I have no idea! 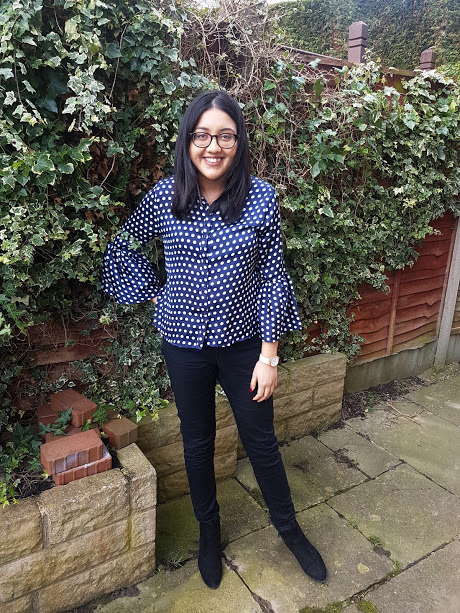 This polka dot shirt* is just £15 and can be worn either dressed down or dressed up. I love that it has a polka dot print and the flare sleeves - I think you all know that I love a good old sleeve! 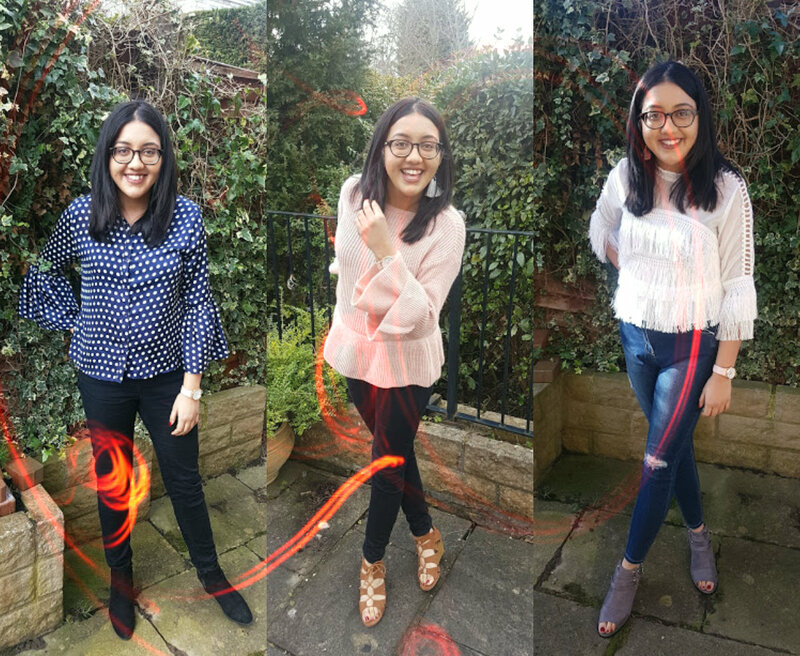 Most of the key pieces in this post are from LOTD, a brand that you will find all over instagram and rightly so. 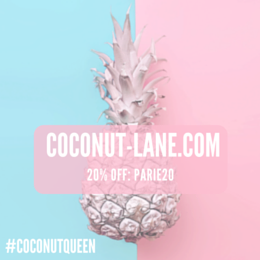 They have everything and anything on their website that you need for any fashion meltdown and they aren't that expensive either! Great if you're on a budget like me. I've paired it simply with a black pair of jeans and black ankle boots. 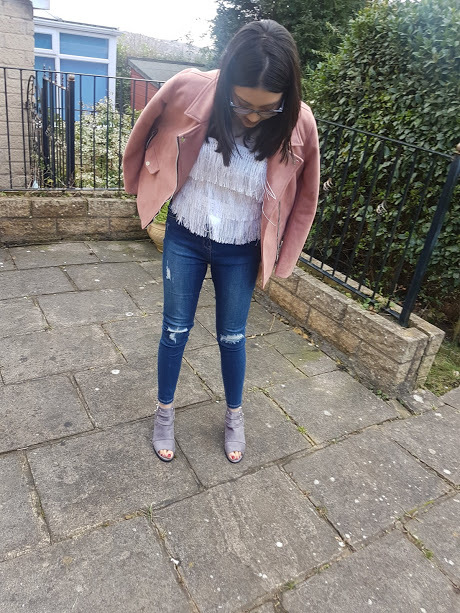 Ankle boots are the perfect transition shoe, they look great with everything and still give you comfort whilst looking very good. This outfit may be very simple and low key but you can't go wrong with jeans and a nice top. Like I said, I love a good sleeve and this jumper proves just that. 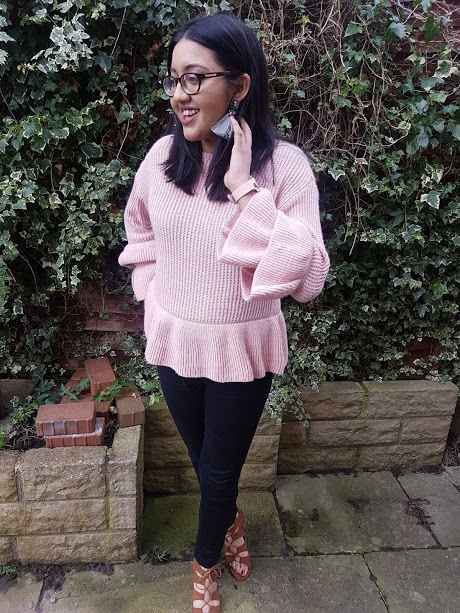 Its a gorgeous double frill jumper* that is just £12, it comes in 5 other colours and I think that I might just have to collect them all because the quality and wear is lovely. It is a lightweight jumper that sits just above the waist with the frill hem. It has the feel of a jumper and look but isn't too chunky that you'll melt if the sun is out. 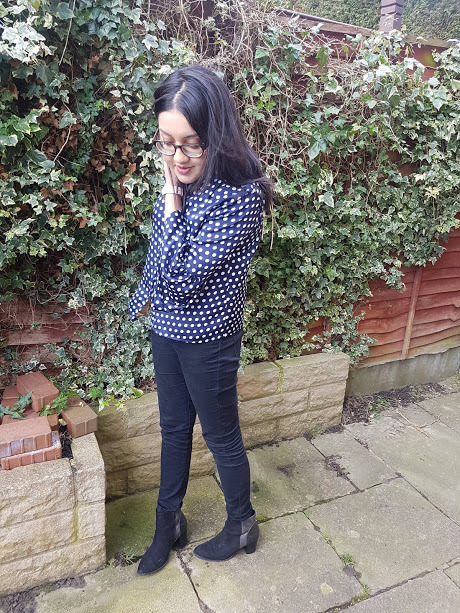 I have loved wearing it with jeans and wedges to give a slight spring like look to the outfit and with boots and a leather skirt to still look cosy and wintery. Such a versatile item to have and wear through the British cold and warm weather. Now, this outfit is full on spring and I don't think it will get much wear until March comes around because that in my books is the start of the new season compared to February which is still cold and wintery. 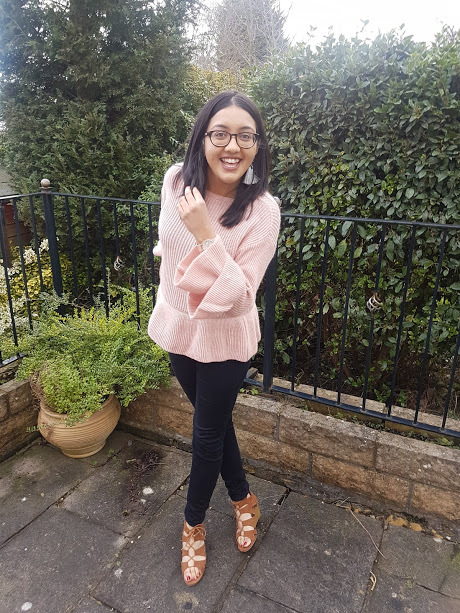 White and pastel pinks are my favourite colours to wear in the spring, whether its on my nails or my clothes- they just look so cute and pretty. It is all centred around this beautiful tassel top* (£15). 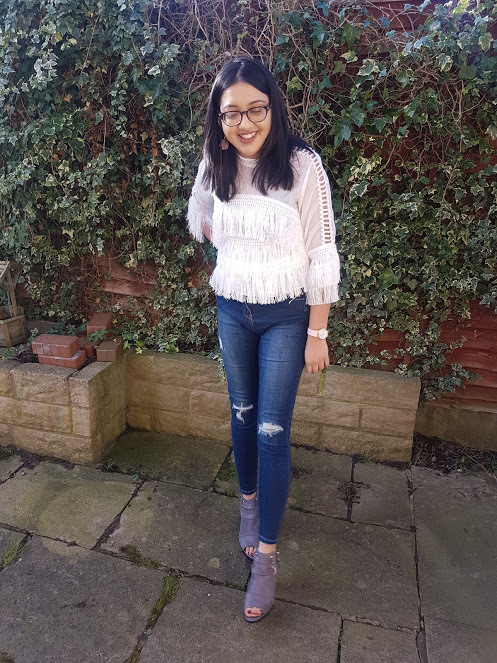 Tassels have never really been my cup of tea but this top just might be the start of an obsession...the white firstly is so pretty, the high neck adds some edge to the top and all the different frills makes me feel like a hoola girl for some reason but I love it. It really isn't anything fancy but it just looks amazing and paired with a pink suede jacket (last year from Miss Guided) and these shoes. Oh my goodness they might just be my favourite pair of shoes ever and for only £20!!! 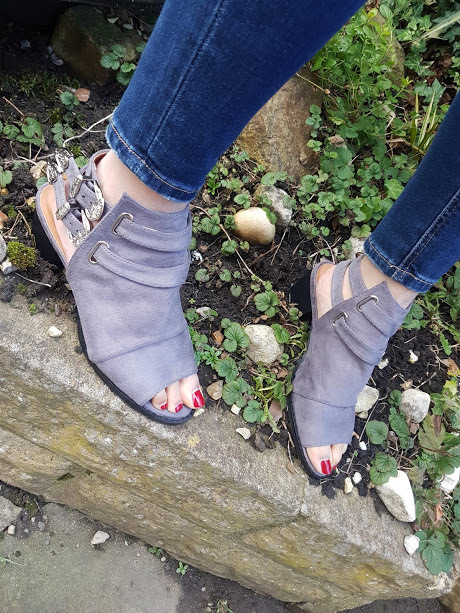 Peep toes have been around for a long time but I've never had a pair like these, a small block heel that is easy to wear during the day and evening and the double strap buckle gives it a real western vibe.